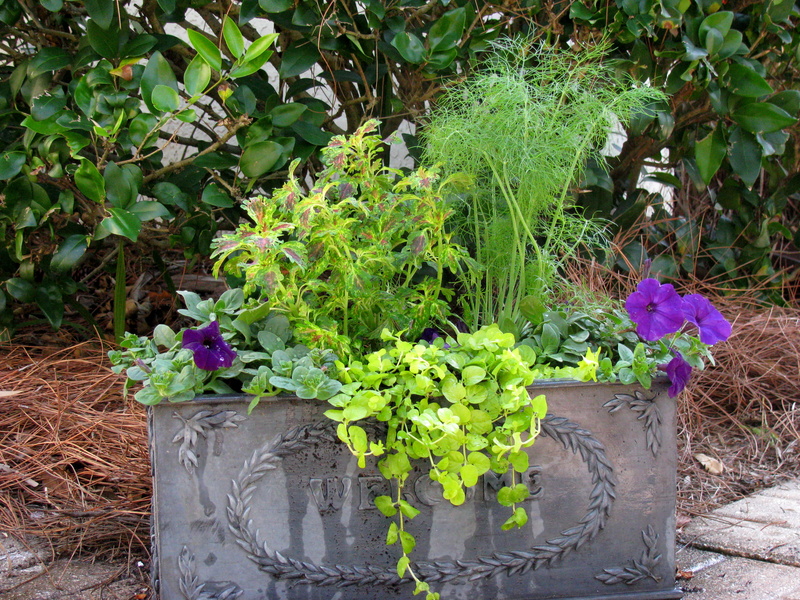 Container gardening is a very popular gardening trend. Mixed plantings in decorative pots can create a wonderful focal point in the landscape or on the patio. Containers full of flowers just seem to grow better during the cooler weather of fall. Select the pot first. Large pots can produce a very dramatic effect, but do consider the final weight of the pot. You may want to provide a plant stand with casters under large pots to make moving easier if necessary. Shallow pots are hard to maintain due to the insufficient rooting depth, unless you are planting a cactus garden. Drainage is very important, so be certain that the pot has adequate drainage holes in the bottom. Choose a potting soil that is light for the size of the bag. One with perlite, peat moss and milled bark will provide good drainage. Using manufactured potting soil instead of soil from your landscape will avoid most soil borne diseases and pests. Now the fun starts as you design the pot. A good combination is a trio of different plants; a thriller, filler, and a spiller. The thriller is a tall accent plant, fillers are mounding plants and spillers are trailing plants. You may need more than three plants if it is a large pot. In the pot that I am creating in the pictures, there are two thrillers since is it a longer rectangular pot, a coleus and, just for fun, an edible fennel plant. The fillers are purple petunias and the trailing spiller is Lysimachia ‘Goldilocks’. In a round pot you would want to stick with one tall accent plant and add multiples of the mounding and/or trailing plants. Be bold with color. Choose plants with contrasting foliage and flower colors. Fill the pot a little more than half way with potting soil and then begin placing the plants. You will want the soil to be about 1 – 2 inches below the rim of the pot when you are finished planting to allow space for watering. As you remove each plant from its pot, loosen the roots a little so that they will grow out into the potting soil. 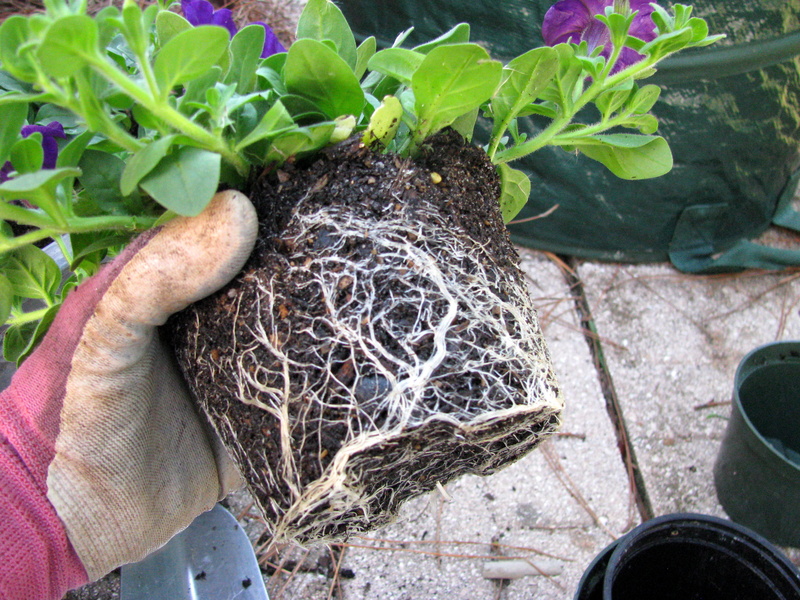 Be careful to keep each root ball level with the final top of the potting soil. Water well as you plant to settle the soil around each plant. Apply a balanced slow release fertilizer (13-13-13) as you complete your planting. 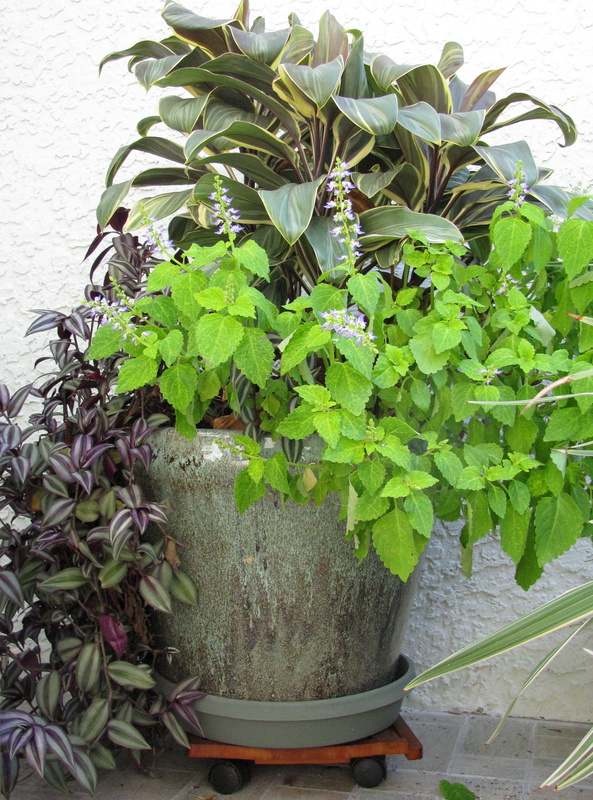 Containers can dry out quickly since fall and winter is usually quite dry here in Central Florida. Give your container water when the top one inch of the soil feels dry. Unglazed pottery may need water daily while it is still warm. Scout for pests often, deadhead flowers frequently, and prune lightly to keep everything in shape. Annual flowers need plenty of fertilizer to continue looking good, so apply the same balanced fertilizer to your pot again in mid January. Your creation should last until spring if we have a mild winter or if you have chosen cold hardy plants. 1. Choose the proper site – near the house and close to source of waterVegetables need 6 hours of full sun. Watch out for tree roots and choose a site that is well drained where water doesn’t pool or stand. Our prime gardening time is October to May, so consider where the sun is in the sky. In fall the sun moves towards the south and is most southerly during the winter, then slowly moves back towards directly overhead by summer. Consider whether trees will produce more shade during the growing time for your vegetables. A little shade can be a good thing for extending the growing season into early summer for leafy veggies like lettuce and chard. Do you need a fence to keep out small critters? A tall fence can serve as the trellis for beans, tomatoes, cucumbers etc. 2. Make a plan – decide what you want to grow. What do you like to eat? Use the University of Florida/IFAS Vegetable Gardening Guide (VGG) (http://edis.ifas.ufl.edu/vh021) to determine the proper planting times. You will be planting different vegetables at different times. Decide if you will grow your own transplants from seed. You will get the best variety this way, but it requires more advance planning. Some veggies do best seeded directly into the soil. Watch sun patterns and plant tall crops where they will not shade shorter crops. If you have not vegetable gardened before, start small until you get some experience. 3. Prepare the soil - Summer is the best time to get your garden ready for a full early fall planting. You can also solarize the garden plot to help reduce soil borne insects and diseases. During the summer you can compost directly in the ground – bury vegetable kitchen waste, coffee grounds, etc and wait for it to decay (at least a month) – spade well when you are ready to plant. If using uncomposted manure – wait 3 – 4 months before planting. If you are just now getting started, add organic matter; compost is great for gardens; watch for tree & shrub roots since they compete for water and nutrients. You can trench and put roofing paper inside as a barrier to roots. 4. Get the soil tested for pH. Best for vegetables is 5.8 – 6.8, but 5.5 – 7 is okay. When you receive your results you will also receive recommendations for adjusting your pH to the proper levels. However, if your soil is naturally above a pH of 7, there is no reliable way to lower the pH – it will only be temporary – you might consider containers or raised beds with manufactured soil. 5. Consider starting a compost pile or bin. 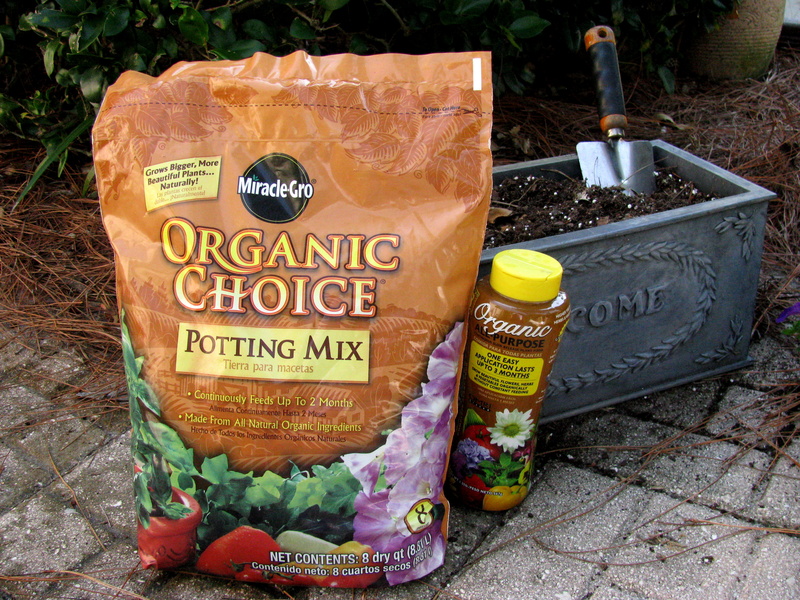 Compost is sometimes called garden gold – compost adds needed organic matter to Florida’s infertile native sandy soils. 6. Fertilizer and Water are essential – Vegetables cannot tolerate standing water- but they need adequate soil moisture to grow and produce. Sandy soils amended with considerable organic matter will hold moisture better. Consider using mulch after your garden is planted to also help with water retention. Micro-irrigation is really great for gardens – it can be as simple as running a soaker hose up and down each row, or you can install a more elaborate system. Young plants will need a light watering more frequently – as the plants mature, water deeply less frequently. Seeds need constant moisture until they have sprouted and have two sets of leaves. Vegetable plants grow fast and need plenty of nutrients to fuel that growth. Incorporate a balanced fertilizer (6-6-6) in the garden just as you plant and then band fertilizer down rows two to three times during the growing season. Refer to the Veg. Gardening Guide for amounts to use. Don’t use lawn fertilizers on vegetables – Nitrogen is too high and potassium too low. · Work the soil in advance of planting – remove grass, weeds, roots, etc. · Control weeds in and around garden – use mulch like straw and fallen leaves, newspapers, it is best not to use wood mulches. · Put collars around transplants to protect from cut worms – collar should extend at least 1 inch below and several inches above the ground. · Scout often (twice/week) for pests and remove any you see - or remove diseased plants. · Many plants will produce well even with 10 – 20 percent leaf loss. Don’t panic too early. · Harvest fruiting crops like tomatoes, peppers, squash and beans when ripe – overripe produce can attract additional insects. · Remove plants as soon as they stop producing. Use pesticides wisely – not all pesticides are labeled for use on vegetables – learn to identify the pest and read the label to be sure that the insect and the vegetable are listed. Follow all directions on the label and wear listed safety gear. Don’t apply on windy days. For slugs and snails – use a product containing iron phosphate – it is safe around pets and other animals. Apply pesticides in late afternoon or early evening when bees and other pollinators are less active. The VGG has a list of pesticides and their uses. Fungus diseases can usually be controlled with sulfur, horticultural oils (especially Neem oil) and chemicals like cholorothalonil, maneb or mancozeb. Sprays are generally more effective than dusts. Remember, fungicides only prevent fungal diseases, they cannot cure them. 8. If you don’t have room for a conventional vegetable garden - consider some alternatives. 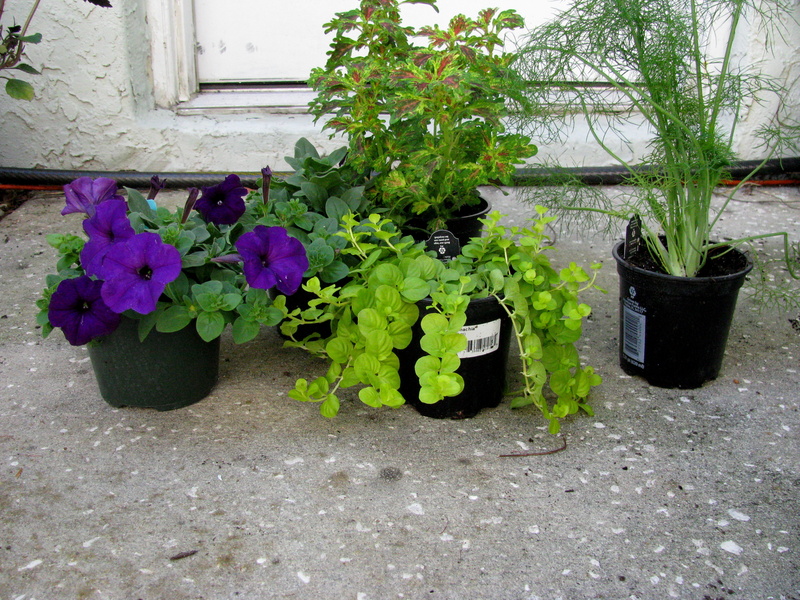 Containers are very convenient – just choose one large enough for your plant to have a good root system. Several commercial self-watering systems on the market. You will definitely need to use a good fertilizer with micro-nutrients added. Also, put some compost in the mix – about 1/3 of the volume. Edible landscaping is also an option. Putting vegetable plants in among your ornamentals, such as a border of red lettuce, or a pepper or two tucked in with your annuals. It is possible to grow some veggies just about anywhere there is ample sun. Up –side- down planters for tomatoes are out there. It just requires a sunny site and a place to hang the planter.